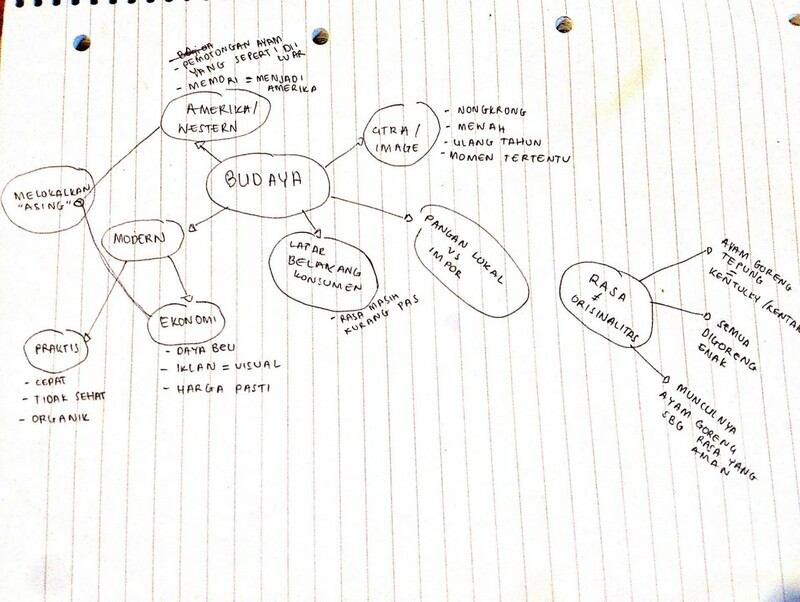 With the help of KUNCI Cultural Studies Centre, we finally held our first meeting with all participants of Bakudapan. When the time hit 18.30, one by one the participants started to arrive. We greeted the participants by serving (almost) fast food snacks; fried tofu and soda drink. Perhaps because our study group is about food, our participants kindly contributed to the meeting with snacks of their own. After forty minutes almost all the participants had arrive and so we decided to start the discussion. 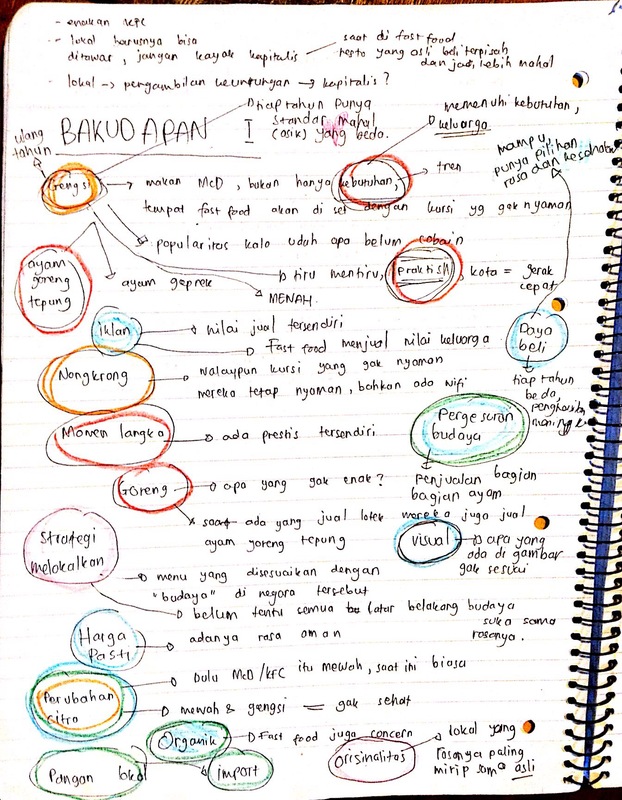 At first Bakudapan gave a brief introduction and background of the project and why we chose this topic. The participants came from different backgrounds and most of them hadn’t met each other yet, so we encouraged a short introduction exchanging names and also why they wanted to join Bakudapan. What became interesting was the reasons they decided to join Bakudapan, ranging from hobbies such as cooking and eating to the sheer curiosity of what will this project may become. Like the participants, we (the initiators of the project) also feel curious about what this project will become and which direction it may take. During the introduction,a few questions arose specific to the individual backgrounds of the participants. One of the participants came from the University from the Department of Food and Agricultural Product Technology, everyone was curious about what this department focused on and its relation to food. The diverse backgrounds of the participants made our discussion more rich when we started to discuss food. Speaking about fast food, it already has wide coverage. Some participants mentioned Padang Rice, warteg or warung burjo (nowadays better known as warmindo) as also being part of the category of fast food. At the beginning of the discussion we decided, by agreement that fast food would be defined as those using a franchise system, be it local fast food or international fast food franchises. The franchises we discussed must also process all food in one location and then distribute to their franchise outlets. Notes when we had the first meeting. The discussion began by focusing on the perceived prestige of fast food. One of the participants mentioned his experience hanging out in McDonald’s and that it’s considered as something luxurious, even though the setting of McDonald’s is actually quite uncomfortable. Interestingly, it is their intention to make the people not too comfortable so they don’t hang out to long, but still there are people who feel fine with this. When discussing the prestige side of fast food and its recent luxury status, we cannot forget the status or associated when holding a birthday party in a famous fast food franchise, such as McDonald’s or KFC. There are special, and expensive birthday packages for fast food parties. Participants recounted memories of feeling jealous when their friends had birthday parties at McDonald’s or their happiness when they were invited as a guest to a KFC birthday party. One interesting story came from a participant reminiscing of when he was still in elementary school – he sold popsicles at his school and used the profit to buy his entire family fried chicken from KFC. It become a source of pride for him, because at that time fast food was still a new and luxurious product. These stories continued throughout the discussion, recounting the moment you enter a fast food restaurant, open the door and feel the cool breeze from air-conditioning, then being greeted with a warm welcome and smile from the cashier reading to take to order. You are seated inside a colourful interior and can hear optimistic music playing, while enjoying a piece of fried chicken with its secret ingredients. For our generation (born 1980’s-90’s) these moments are hard to forget. We are not only sharing this experience with our generation in Indoneisa, but we feel that we are sharing the same experience with other kids outside of Indonesia, like America. Notions of prestige are just one outcome of the successful promotion of famous fast food franchises, furthermore this also becomes a symbol of modernity and globalisation. It seems as though the famous fast food franchises having the same menus in every country they occupy, but not all countries have the same taste preferences. One of the strategies used is catering menus according to the cultural background and tastes. One of the one participants who has Minang blood (is from West Sumatera) stated that the taste of fast food is still very bland for him, even though the fast food franchise had already adjusted the menu to cater to local taste, she would still prefer her traditional food, which has a richer taste for her. Summary from the first meeting. So now the sentiment and experience of the famous (international) food franchise is well known to all, we realise the experience of local fast food in Jogja cannot be separated with the experience of the famous (international) food franchise. Bakudapan will attempt to trace the history of local fast food which has similar menus to the international food franchises suchas; fried chicken, french fries, hamburger, doughnuts, etc. Participants recounted memories of when instant batter to make KFC inspired chicken first appeared (Indonesians call it kentaki) and become very popular. “It is cheap and the taste is great,” said one of the participants’ mother back then, but the son still feels that real KFC tastes better. After the invention of instant batter for homemade fried chicken it actually made mothers less creative in kitchen, because suddenly, it was used in everything. This may have been the beginning of tahu kentaki (tofu fried with fried chicken dough). Interestingly, the discussion continued on mentioning every part from chicken that is uncommon to served in famous fast food franchises, such as its head, feet, and intestine. When the discussion came back to local fast food, according to some of the participants, things that made local fast worth reckoning were the low price point and the taste which very similar to the famous one. For example, Olive fried chicken have the most similar taste to KFC, and the price is way cheaper than KFC. The discussion about fast food was not only about the taste, but also the effect and visuals of advertising. For example, how up to date local franchises are with health and organic issues, and the fact that the social image of fast food is always changing. Presently, we are mapping a variety of topics to discuss in the next study session for the Fast and Foodrious project.